Advertiser Disclosure: ValuePenguin is an advertising-supported comparison service which receives compensation from some of the financial providers whose offers appear on our site. This compensation from our advertising partners may impact how and where products appear on our site (including for example, the order in which they appear). To provide more complete comparisons, the site features products from our partners as well as institutions which are not advertising partners. While we make an effort to include the best deals available to the general public, we make no warranty that such information represents all available products. Capital One® SavorOne℠ Cash Rewards Credit Card Review: Should You Apply? One of the best no-annual-fee cards for dining and entertainment purchases. Editorial Note: The editorial content on this page is not provided or commissioned by any financial institution. Any opinions, analyses, reviews, statements or recommendations expressed in this article are those of the author's alone, and may not have been reviewed, approved or otherwise endorsed by any of these entities prior to publication. This site may be compensated through a credit card partnership. Capital One recently launched the Capital One® SavorOne℠ Cash Rewards Credit Card, and it's quickly become one of the better no-annual-fee options for people who dine out a lot or those who frequent live events, like music festivals. Despite launching alongside the Capital One® Savor® Cash Rewards Credit Card, there's no comparison—this is the better choice for most people. All that said, there are other options you should consider before applying for this card, given you could stand to earn more cash back rewards. How Does the Capital One® SavorOne℠ Cash Rewards Credit Card Compare? What makes this card so great is the high 3% cash back you'll earn on dining and entertainment purchases. Both of those categories are quite broad, meaning you'll be able to take advantage of a high cash back rate across a variety of purchases. For instance, you'll get 3% cash back for fast food purchases as well as when you buy movie tickets, making this a great card for anyone who enjoys hitting the town. There aren't many cards that offer more than 2% cash back on dining. And of the ones that do, even fewer come without an annual fee. The Uber Visa Card actually earns 4% cash back on dining, but it doesn't offer cash back for entertainment purchases. Both of these cards are among the best picks for earning cash back rewards. Note: The information in this box was provided by Capital One and is not part of our independent analysis. We estimate that the Capital One® SavorOne℠ Cash Rewards Credit Card will earn the average consumer $416 in cash back in year one and $266 in year two and onward. This is a great value proposition when you consider the fact that the card comes at no cost to you. 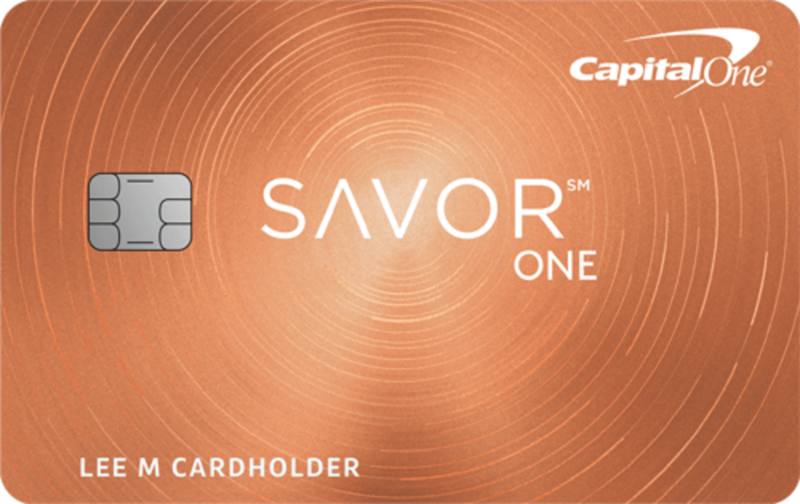 The biggest downside of the Capital One® SavorOne℠ Cash Rewards Credit Card is that it has a small sign-up bonus ($150 once you spend $500 within three months). A typical sign-up bonus for a no-annual-fee card is around $500. Despite this, the Capital One® SavorOne℠ Cash Rewards Credit Card offers great ongoing rewards, so in the long term it will remain an excellent pick. Bottom Line: If you're searching for a card that combines high rewards for dining and entertainment, it will be difficult to find a better card. We consider the Capital One® SavorOne℠ Cash Rewards Credit Card to be one of the best no-annual-fee credit cards currently available. How Does the Capital One® SavorOne℠ Cash Rewards Credit Card Compare to Other Cards? If you spend a lot of money on dining and entertainment, the Capital One® SavorOne℠ Cash Rewards Credit Card is one of the better cards that's available. However, some competing cards perform better in certain areas, so you should compare options before applying for the Capital One® SavorOne℠ Cash Rewards Credit Card. If you're interested in a no-annual-fee card, we recommend you read our comprehensive guide. For most people, the Uber Visa Card will be the better card between the two. That's because the Uber Visa Card offers higher cash-back rewards among more categories. Both cards come without an annual fee, so your choice between the two cards should come down to which of the cash back categories you spend the most on. Both cards offer sign-up bonuses that we consider to be below average, so we don't recommend making your pick based on those figures. The Capital One® SavorOne℠ Cash Rewards Credit Card offers a $150 sign-up bonus after spending $500 within the first three months, and the Uber Visa Card offers $100 after meeting the same spending requirement in the first 90 days. Below, we outline how the two cards compare across a variety of cash back categories. Get a $100 bonus after spending $500 on purchases in the first 90 days. Earn 4% back on dining, 3% back on hotel and airfare, 2% back for online purchases, and 1% back on everything else. If you prefer simplicity in earning cash back, the Citi® Double Cash Card is the better choice between the two cards. However, if you're OK with having multiple categories with different cash back rates, the Capital One® SavorOne℠ Cash Rewards Credit Card should be your pick. The Citi® Double Cash Card is a great card because you won't have to consider which of your cards will net you the highest cash back rewards. That's because the Citi® Double Cash Card offers a solid 2% cash back rate on all purchases: 1% when you make a purchase and another 1% as you pay it off. Most other fixed-rate cash back cards offer rewards in the neighborhood of 1.5%. Just keep in mind that if you choose to apply for the Citi® Double Cash Card, you'll forgo the 3% cash back on dining and entertainment purchases available through the Capital One® SavorOne℠ Cash Rewards Credit Card. There are no caps and no category restrictions. Earn 2% cash back on purchases by earning 1% when you buy plus 1% as you pay. Between these two cards, the Capital One® SavorOne℠ Cash Rewards Credit Card will be the better choice for most people. The Capital One® Savor® Cash Rewards Credit Card charges a $95 annual fee and offers a higher cash-back rate, 4%, on dining and entertainment purchases. We estimate that for the Capital One® Savor® Cash Rewards Credit Card to make sense over the Capital One® SavorOne℠ Cash Rewards Credit Card you would have to spend approximately $396 per month on dining and entertainment purchases. That's a threshold that most people won't be able to reach. Pay a $95 annual fee, which is waived the first year. Earn a $500 bonus after spending $3,000 in the first three months. Get 4% cash back on dining and entertainment, 2% at grocery stores, and 1% on all other purchases. Anyone searching for a card that will give the most rewards for their specific spending habits can use our card comparison tool below. Simply click "edit" and enter your monthly expenses. Our tool will estimate the 2-year rewards you stand to gain from each card. Info about the following cards: American Express® Gold Card, Delta Reserve® Credit Card from American Express, Hilton Honors Surpass® Credit Card, American Express® Blue Sky, American Express® Green Card, The Amex EveryDay® Preferred Credit Card from American Express, The Plenti® Credit Card from Amex, Blue from American Express®, Platinum Card® from American Express Exclusively for Mercedes-Benz, Bluebird, Centurion® Card from American Express, Hilton Honors American Express Aspire Card, and Starwood Preferred Guest® American Express Luxury Card has been collected independently by ValuePenguin. The issuer did not provide the details, nor is it responsible for their accuracy. Advertiser Disclosure: The products that appear on this site may be from companies from which ValuePenguin receives compensation. This compensation may impact how and where products appear on this site (including, for example, the order in which they appear). ValuePenguin does not include all financial institutions or all products offered available in the marketplace. How We Calculate Rewards: ValuePenguin calculates the value of rewards by estimating the dollar value of any points, miles or bonuses earned using the card less any associated annual fees. These estimates here are ValuePenguin's alone, not those of the card issuer, and have not been reviewed, approved or otherwise endorsed by the credit card issuer. Example of how we calculate the rewards rates: When redeemed for travel through Ultimate Rewards, Chase Sapphire Preferred points are worth $0.0125 each. The card awards 2 points on travel and dining and 1 point on everything else. Therefore, we say the card has a 2.5% rewards rate on dining and travel (2 x $0.0125) and a 1.25% rewards rate on everything else (1 x $0.0125). Cash Back, Miles, or Points: What's The Difference?